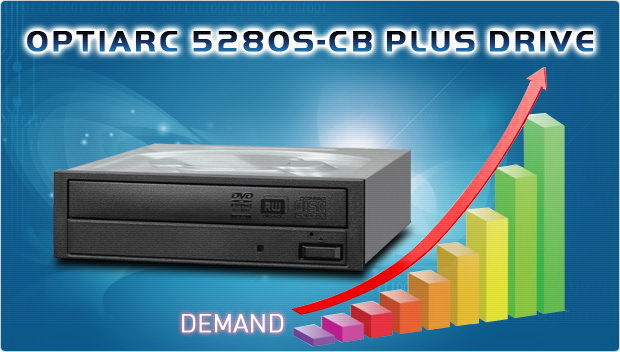 When Sony decided to exit the ODD market and relinquished all rights to the Optiarc 5280S-CB PLUS (“CB PLUS”) drive to Vinpower Digital, we had no idea what the true market demand would be. Although Vinpower helped Sony develop the CB PLUS Drive, we expected it to have a specific target audience in the duplication market. It turns out that the CB PLUS drive, because of its more robust hardware, improved burning capability, and special DVD+R DL 8.7GB Overburn feature, has made the drive even more desired than we anticipated. Now Vinpower is struggling to keep enough inventory in stock to meet the market demand. Because of this, Vinpower has requested that the factory increase the current production rate by more than 200%. If you are not familiar with the Optiarc 5280S-CB series of drives, including the CB PLUS model, feel free to review them on the Vinpower website at http://www.vinpowerdigital.com/en-us/main/product.aspx?CategoryID=83&Keyword=DVD_Burner. See for yourself why these drives have taken the world by storm!